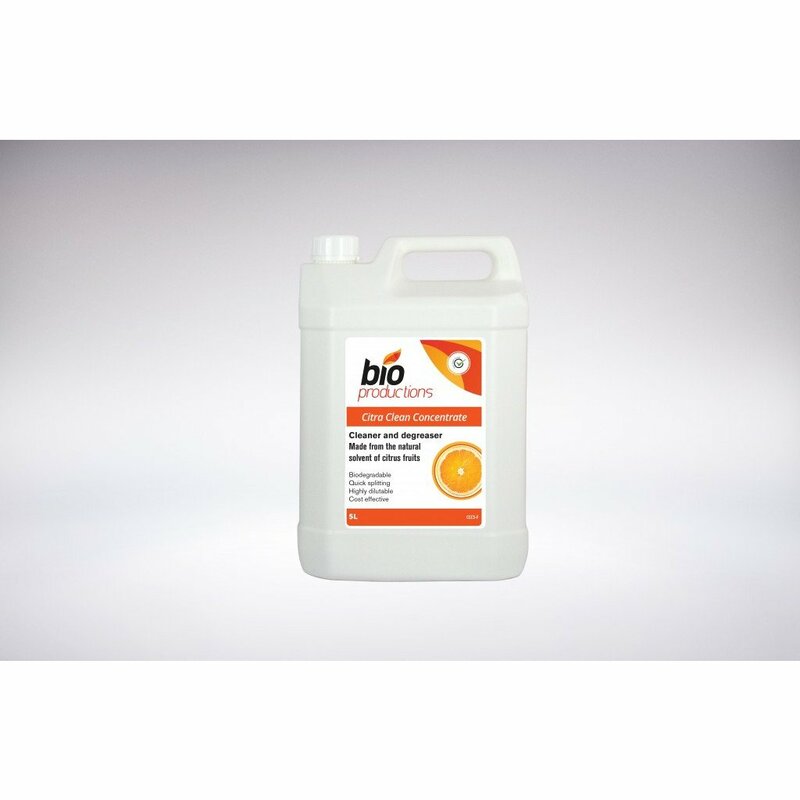 Citra Clean Concentrate is a powerful multi-purpose cleaner formulated from natural orange terpenes which leaves a pleasant orange fragrance after use. Terpenes are a large and diverse class of organic compounds. Citra Clean's unique formulation is free from petroleum based chemicals and solvents, and with it's neutral pH of 8.5 is one of the gentlest but most versatile and powerful cleaners you will ever encounter. Probably the only cleaner required and one of the most powerful and versatile cleaners available. Citra Clean may be used successfully for all types of janitorial and most industrial cleaning applications. Undiluted it will remove chewing gum and tar from carpets as well as grease, ink, adhesive and sealant from almost any surface. Powerful enough to strip polish, wax and even some graffiti from hard surfaces and flooring, yet diluted it becomes the perfect carpet, upholstery and general-purpose cleaner. Citra Clean is great on walls, painted surfaces, concrete and terrazzo. It will quickly remove sticky finger marks as well as black shoe scuffs. For caterers, Citra Clean lifts grease and carbon from ovens, cleans griddles, BBQ's, and all types of ducting and extraction filter equipment. In the industrial market, this remarkable product removes greasy grime and oil from machinery, vehicles and work areas, as well as oil and diesel spillages from drives and floors. Citra Clean out performs many cleaners dedicated to marine, agricultural and industrial applications. It is low foaming and easily rinsed, biodegradable, highly dilutable and un-classified under CHIP and current EEC regulations, Citra Clean is also ideal for industrial applications where quick separation of the cleaning solution from the soiling is important to minimise the risk of pollution. Suitable for use on all washable surfaces, carpets and fabrics including terrazzo, stainless steel and colourfast upholstery products. Ideal in schools, hospitals and institutions where the selection of safer cleaning agents is important. Tar, grease, baked-on carbon, wax, soot, oil, ink, toner, adhesives, sealant, glue, polish, fat, crayon, blu-tac, plasticine, lipstick, chewing-gum, smoke damage, nicotine, scuff marks, tyre marks, body-fats, sweat, finger-marks, traffic film, insects, and even some graffiti. Safely strips all floor polishes and adhesives without damaging the flooring. Kitchen- walls, floors, filters, extraction hoods, cooker-tops, ovens, worktops, griddles and all hard surfaces. Shops, offices and public buildings-carpets, upholstery, plastic and melamine, chrome, ceramic tiles, lino, terrazzo, paintwork. Sports and amenity centres- showers, ceramic tiles and swimming-pool surrounds, washrooms, carpeting, terrazzo, vinyl, marble, chrome, stainless steel, paintwork, patio furniture, barbecues, bouncy castles. Automotive, marine, workshops and engineering- engines, paintwork, wheels, plastic trim, chrome, upholstery and carpets, vinyl, canvas, concrete floors, metalwork, machinery, tools and equipment, workbenches, general work areas, tyre bays, petrol-pumps and islands, parts washers, pressure washers, dip tanks, toilets, washrooms, public areas, and walk-mats.